McArthur River/Key Lake, located in northern Saskatchewan, Canada is the world's largest high-grade uranium operation. Due to continued market weakness, in July 2018, Cameco made the decision to extend the planned 10-month production suspension of this operation for an indeterminate duration. 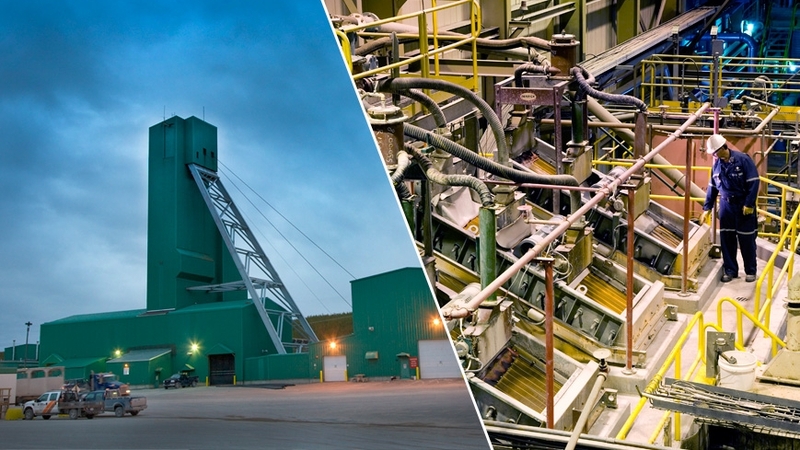 In service since 1999 and 1983 respectively, Cameco operates the ISO 14001 certified locations, which have collectively produced 535 million lbs using a variety of mining methods. This year, beginning in February, we had a planned production suspension. In response to market conditions, we decided to extend the suspension for an indeterminate duration. The action resulted in the permanent layoff of approximately 520 site employees. A reduced workforce of approximately 200 employees remain at the McArthur River and Key Lake sites to keep the facilities in a state of safe care and maintenance. We incurred approximately $29 million in severance costs as a result of the permanent layoffs. Production from McArthur River/Key Lake for the year was 0.2 million pounds (100% basis); our share was 0.1 million pounds compared to 11.2 million pounds in 2017 due to the production suspension in 2018. 1 The McArthur River/Key Lake and Rabbit Lake operations are in a safe and sustainable state of care and maintenance. Please see Uranium - Tier-one operations beginning on page 61 of our 2018 Q4 MD&A for more information. We must bring on new mining zones to sustain production. Prior to the production shutdown, two new areas were under active development. Zone 1 was in the freeze drilling stage (90% complete) and zone 4 South was in the initial freeze drift development stage. In 2018, all development and construction activities for the new mining zones were halted as part of the production suspension. In 2018, all underground infill definition drilling was halted as part of the production suspension. Due to continued uranium price weakness, we have suspended production for an indeterminate duration. As a result of the suspension, and the time required to restart the mine and mill, we do not expect the operation to produce any uranium in 2019. Our share of the cash and non-cash costs to maintain both operations during the suspension is expected to range between $7 million and $9 million per month. Once the market signals that new supply is needed and a decision is made to restart production, we will undertake the work necessary to optimize the capacity of both the McArthur River mine and Key Lake mill. The annual licensed capacity is 25 million pounds per year (100% basis). We expect that this paced approach will allow us to extract maximum value from the operation as the market transitions. Worker safety, environmental monitoring and proper decommissioning, after mining is completed, are of the utmost importance to Cameco. Our mineral reserves and resources are the foundation of our company and fundamental to our success. Key Lake is the world’s largest high-grade uranium mill. Routine water sampling is part of a rigorous environmental monitoring program in place at each operation. McArthur River high-grade ore arrives as a slurry in special totes after being trucked 80 kilometres south to the Key Lake mill. McArthur River is the world’s largest high-grade uranium mine. Underground at McArthur River, 'snowmen' circulate a brine that keeps the porous rock surrounding the orebody frozen. Mining at McArthur River takes place between 530 and 640 meters below surface. Numerous tests to measure radiation are part of a rigorous monitoring program in place at each operation. This page may contain forward-looking information that is based upon the assumptions and subject to the material risks discussed on page 2 of Cameco's most recent Quarterly MD&A.